Tesla factory upgrade reveals dedicated production center for dual motor Model S, faster overseas deliveries and robots named after X-Men superheroes. We knew Tesla was hard at work on expanding the Fremont factory in California but the details have been fuzzy at best. The expansion efforts were rumored to be groundwork for future production of the Model X and Tesla’s ultimate vision, the affordable mass-market Model 3. But all was confirmed today when Tesla outlined the details of the factory upgrade in their latest blog post. 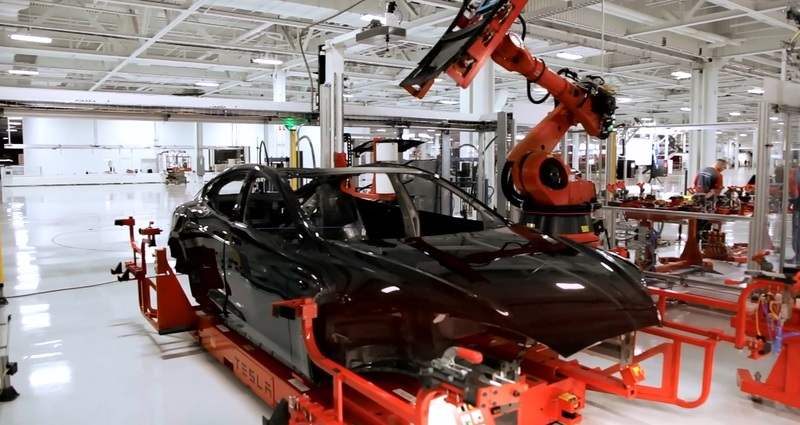 Seeing the time-lapse video of Tesla’s recent factory upgrade further brings to light why Tesla Motors has been able to elevate itself to a status that no other automaker has been able to achieve in the last century – reinvent the auto industry’s sales and manufacturing paradigm while laying a path to the future of automotive transportation. Like any great Silicon Valley start up, albeit this one sits on a healthy $32 billion dollar market cap, life and death often teeters between a well-positioned move that may catapult a company into instant success or a deathblow due to inefficiencies, slow time to market and an excessive cash burn. Tesla Motors is no different, yet … so different. A dedicated section for production of the Dual Motor Model S.
Model S batteries will be installed by robots; cuts installation time by 50% over human labor. Production capacity of over 50k cars by end of 2015. New export docks to increase delivery speed to overseas buyers. Traditional overhead mechanical steel structures replaced by robots capable of moving entire cars. And finally we’re all reminded that even in a factory predominantly occupied by complex machinery and robots, Tesla Motors is a human company. A photo wall pays homage to the evolving auto industry pioneered by some of the largest automakers (GM and Toyota) who occupied the same space 26 years prior to Tesla’s arrival. Tesla Model X’s Gull Wing Doors, Culprit?